Yinarupa Nangala's emotional acceptance of the General Painting Award was extremely moving. Set to a dramatic sunset backdrop over the waters of Fannie Bay in Darwin this wonderful artist approached the lecturn and couldn't restrain the tears. Yinarupa is indeed a deserving winner of the prestigious General Painting Award with her superb depictions of the rockhole site of Mukala, east of Jupiter Well in Western Australia. 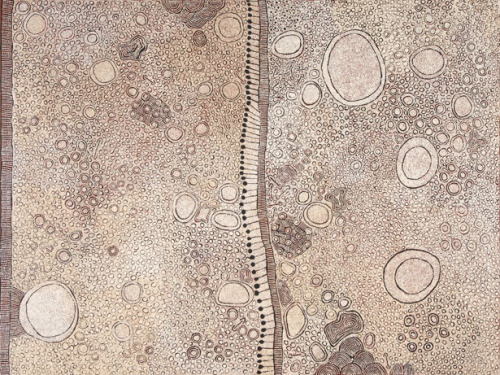 GENERAL PAINTING AWARD WINNER - Yinarupa Nangala - Untitled Synthetic polymer paint on linen h 183 x w 244 cm This painting depicts designs associated with the rockhole site of Marrapinti, west of the Pollock Hills in Western Australia. In ancestral times a group of women camped at this site. The shapes in the painting represent the features of the country through which they travelled as well as the bush foods they gathered. The Telstra General Painting Award was awarded to Yinarupa Nangala from Kiwirrkurra in Western Australia for her untitled work. The Telstra Bark Painting Award was awarded to Rerrkirrwanga Munungurr from Wandawuy (East Arnhem Land) Northern Territory for her work Gumatj Gurtha. The Telstra Works on Paper was awarded to Glen Namundja from Gubalanya (Western Arnhem Land) Northern Territory for his work Likkanaya and Marrayka. The Wandjuk Marika Three-Dimensional Memorial Award was awarded to Janine McAullay Bott from Perth for her work Dhalkatj – Bilby.